Last updated by Shari Harley at January 14, 2019 . Many of us are hesitant to give peer feedback. We worry that giving peer feedback will damage our relationships. We wonder if we have the right and if it’s our place to give peer feedback. And we are concerned about what the consequences of giving peer feedback will be. Giving peer feedback isn’t so different from giving feedback to a friend or even a direct report. While you have an implicit ‘right’ to give a direct report feedback, doing so without building trust will ensure your feedback falls flat. People respond to feedback in predictable ways. Most people get upset and defend themselves. This is normal and natural. Negative feedback conflicts with our desire to be thought well of, which all people (despite what they might say) want. People are more open and less defensive when they trust the source of the feedback and trust the sources’ motives. 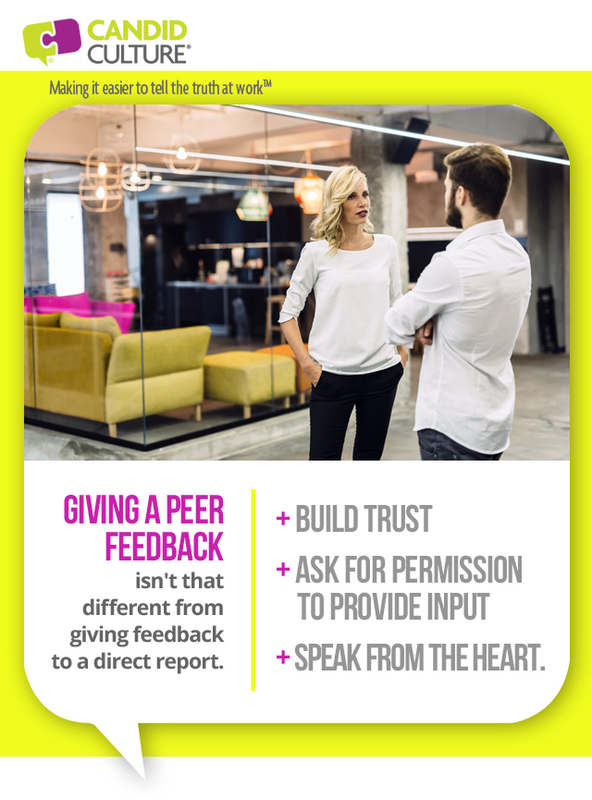 Follow these practices when giving peer feedback and your feedback will hopefully be well received. Think about why you want to give feedback. Really think about this. Is your desire to help the person change a behavior, or are you just being judgmental? If your intention isn’t to help someone replicate or change a behavior, say nothing. It’s not feedback you’re planning to give, it’s only your opinion you want to disseminate. One of my friends recently told me she felt my son’s name was waspy. Her comment wasn’t feedback as there was nothing I could do with the information. She simply gave me her judgmental opinion, which annoyed me. Also consider why you want to give feedback. Do you simply want something done your way, or do you feel strongly that what the person is doing is having a negative impact on him/her or the organization? I worked with a business leader who red lined every document his staff created. He didn’t only change language that was wrong, he edited documents so they were written more akin to his writing style. This made his staff feel that they couldn’t do anything right and it wouldn’t matter what they produced, he’d revise even the most ‘perfect’ work. So they stopped trying. Evaluate your true motive. Just because something wasn’t done your way, doesn’t mean it wasn’t done well. Provided your motives are pure – you’re trying to make a difference for someone and his/her behavior is causing real challenges, it’s ok to speak up. Be sure you have the relationship to give peer feedback. Does the person know you have his/her back? If you speak up, will s/he trust it’s because you care about her or the organization, versus you just want to express your opinion and be right. Lastly, don’t worry about giving peer feedback perfectly. You might follow our feedback formula to a tee. You might not. There is no one right way to give feedback. Speak from the heart. If you’re nervous to have a conversation, say so. If you’re not sure it’s your place to give a piece of feedback, say so. If you’re worried you won’t deliver the feedback well, say that. Saying how you really feel, being human and vulnerable builds trust, relationships, and credibility. People want to work with other real people, and real people have concerns. It’s ok to share them.